Although the glaze is not one that I'm familiar with ......? 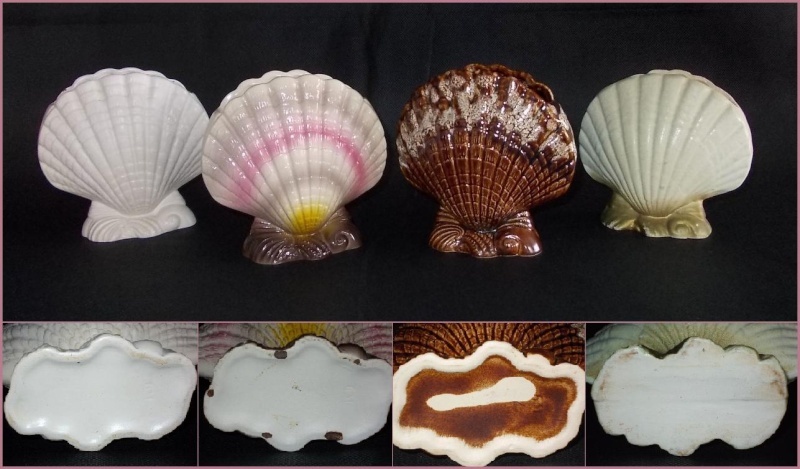 http://www.trademe.co.nz/pottery-glass/porcelain-pottery/crown-lynn/vases/auction-554290332.htm I just wasn't sure about it, as all mine just have a different look to them. I am away camping at the moment, but will post a photo when I get back in the next few days. From memory the bases on mine are like the vases, i.e. the base is slightly concave and has a definite edge to it. My Anselmi shell vase which is the same as the Crown Lynn 631 has an unglazed footring and inside this ring the base is glazed. Kat it looks like the base on your one is flat ..... is that right? 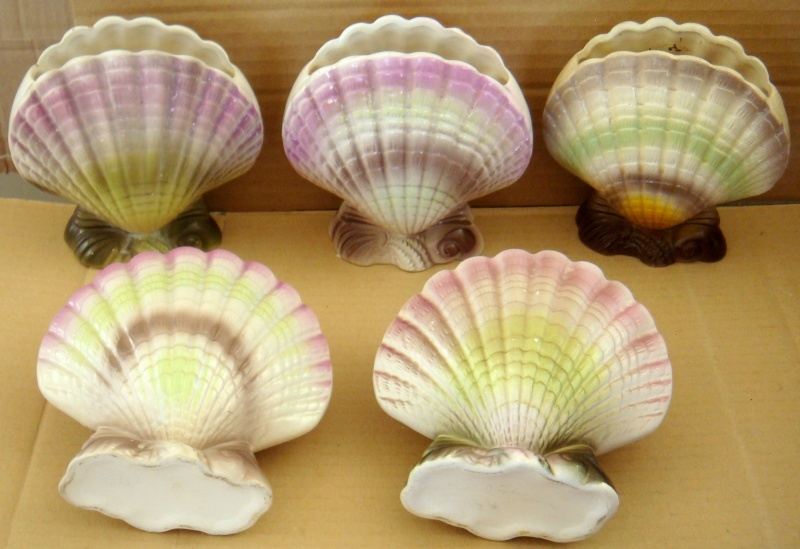 Here are 5 of my shells, all slightly different in colouring on stands and shells, but nothing like that of Kat & Co.
And all have the same base, this one seems less defined than the others, but all have the number 631 on them also. None have a CL stamp. 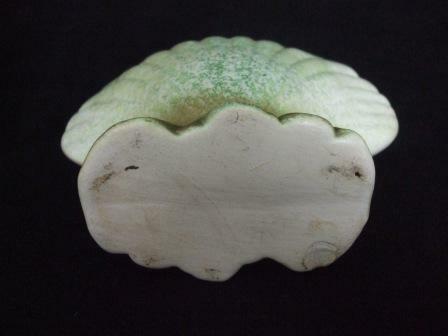 My thought would be that it is not Crown Lynn, but having said that, a couple of my unmarked miniatures (the photo I sent for the waifs topic) have bases which look like Kat's shell, so who knows! Kat, I think all of mine are painted rather than glazed, possibly by Salisbury, as they have the odd little pin head of paint loss on some, which seems to be the case with most of them. Would that be right Ev? I have measurements at home ... just have to remember to find them .. The whole design is slightly different isn't it? It couldn't be Australian could it? I have seen several on e-bay and then realised they were Raynham or Diana. Will post a link if I come across one. I still think its just an early example, they must have used different moulds over the years.. when you look into the interior the shape is identical... theres just less detail on this smaller version maybe? Yes, if it is an Ambrico or specials dept, they tend to be smaller than the later versions of just about everything I have, in comparison. A great mystery, and we will solve it one day I'm sure! 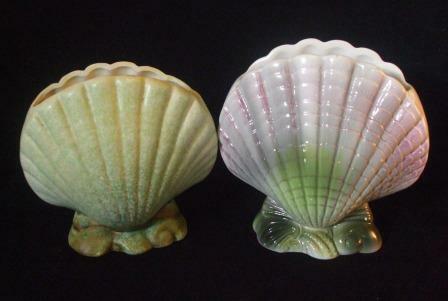 Crown Lynn records have the measurement 5" for the 631 Shell vase with scallops and snails and was first made in 1961. Yes the bigger one is 5" smaller 4.5"
This Shell vase is interesting with early Royal Oak Sticker & is painted..HHhhmmm..
Are all of the 631's painted by Royal Oak/Salisbury .... I ask out loud? Some shapes seem to have been made just for Owen Salisbury, actually there would be quite a few if I took the time to find them. 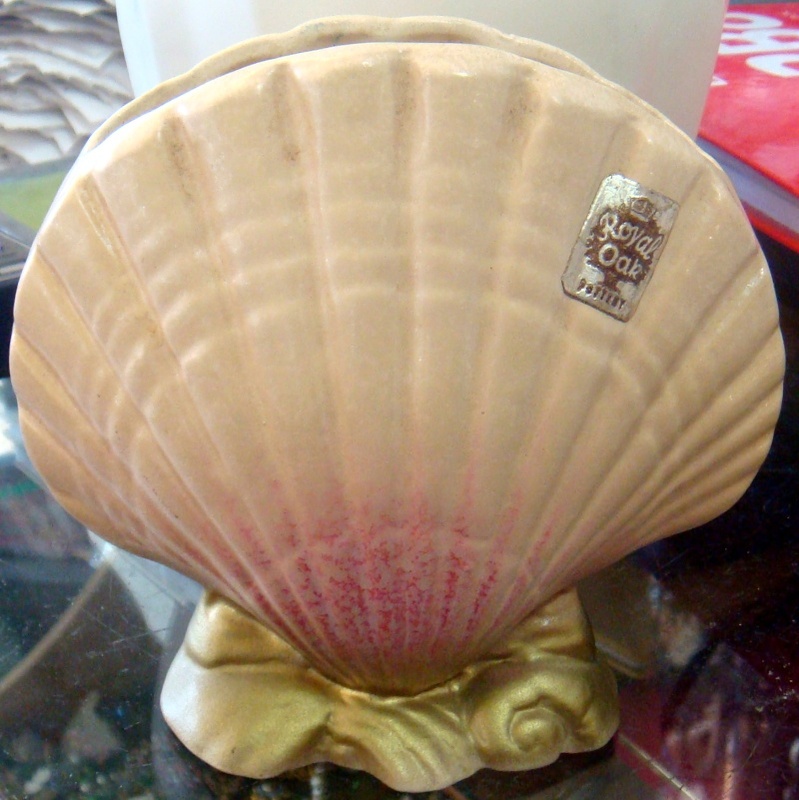 Hello, I have got a marked 631 brown trickle glaze shell vase. When I first saw it I thought it was an Orzel glaze. 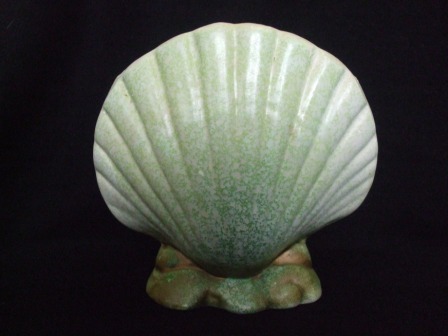 Hi everyone, I have just been into Richmond, and viewed the Royal Oak shell vase that is up for auction. It is 4 1/2" high and has a FLAT base with a casting line through the middle, just like Kat's and the one on the right in the photo sent by haselnuss, no foot ring. 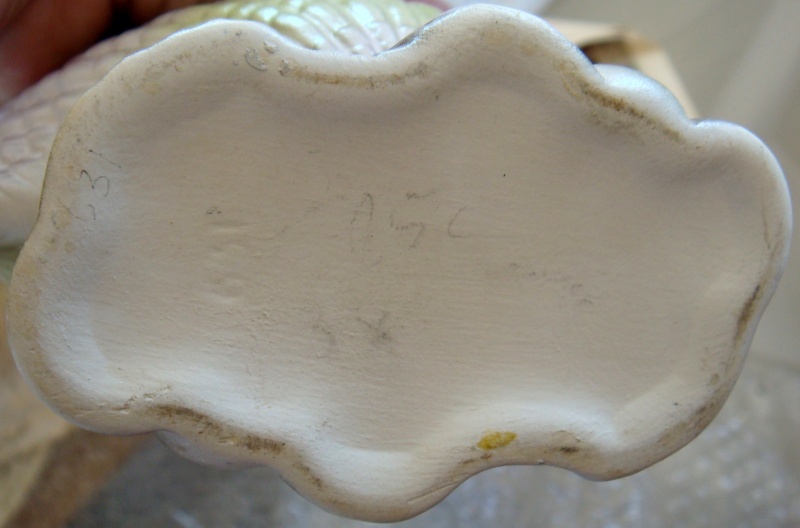 The base is totally unmarked, and the seller is going to add a photo of the base to the auction soon. Excellent!! So... who made this shape first??? Who made this shape first? Well as I said earlier, Crown Lynn made this shape for Royal Oak in September 1961. Royal Oak would have then painted them in a variety of colours and would put their Royal Oak sticker on them. Now that brown with a contrasting colour daubed on top is a weird one. It's not a triple glaze it's what we call one glaze on top of another. Could this have been fired by Royal Oak I wonder? Actually I have no idea as I haven't seen that combination before! Now when did Royal Oak start making their own pottery again? I think it was in the 1960's but later rather than earlier. Royal Oak is synonymous when it comes to flat horrible bottoms! So did CL copy Royal Oak? yes it looks like a Royal Oak bottom..